World 3-1 is the first level of World 3 in New Super Mario Bros.. The level can be bypassed in favor of World 3-A. This level is an underwater level containing several Cheep-Chomps. This level starts out with the player standing on a small section of land. Next to this land is a shallow pool of water that has a Warp Pipe inside of it. The player must go down this pipe in order to continue forth in the level. When Mario exits the Pipe, he is completely submerged in water. At the beginning of the area, there is a Mega Cheep-Cheep and three ? Blocks. All three ? Blocks contain a coin. Five Cheep-Cheeps are encountered shortly thereafter, followed by two Brick Blocks and a ? Block. After a Red Ring is found, several more schools of Cheep-Cheeps are encountered, making it more difficult for Mario to collect all eight Red Coins. Past a pit, several more coins, the Checkpoint Flag, and a Roulette Block can be found. 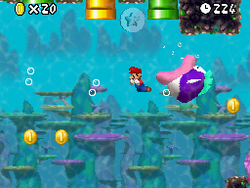 A Cheep-Chomp can be encountered past a green Warp Pipe that is spewing bubbles. It tries to eat Mario as he swims through a maze of pipes that spew bubbles. A Star Coin can be found in between two of the pipes. An upside-down P Switch can be found on a block, and by pressing it, all nearby Brick Blocks turn into coins, allowing access to another Star Coin. After the Star Coin, a second Red Ring can be found. Past the Red Ring, a Warp Pipe can be found. The Warp Piper allows access to ground level, where the Goal Pole is located. Star Coin 1 - After the checkpoint, there should be a green pipe between a red pipe and a green pipe spewing bubbles. Mario should enter the green pipe, and he is transported to a Coin Heaven filled with coin bubbles and Cheep-Cheeps. The Star Coin is at the end. Star Coin 2 - The second Star Coin is directly after the first, in between two pipes that spew bubbles. Star Coin 3 - After hitting the P Switch, Mario should swim all the way to the right where the final Star Coin is. This page was last edited on April 6, 2019, at 01:29.